First of all, Brooke is the SWEETEST person ever! We had so much fun getting to know her and she made my exact vision of what I wanted come to life! She is so talented and does the most beautiful job. She works hard, communicates quickly, and makes sure you love every single thing. I walked into our reception in tears because of how gorgeous everything was. Thank you Brooke! Brooke is amazing! Our first meeting in discussing our dream she knew immediately what we would like and executed it flawlessly on our big day! We will use her with any of our flower needs in the future. Brooke was incredible. I honestly could not be more happy with how our flowers turned out. I leaned heavily on my flowers for decoration and I was not disappointed at all. I could not possibly say enough good things about Brooke. She went out of her way to ensure that our wedding flowers exactly what we wanted. The pictures she had didn't exactly fit my aesthetic, but I went through and told her what I wanted and she killed it. She met with me several times throughout the process and even though I ended up adding a zillion flowers in at the end, she was accommodating and executed them perfectly. She was also really good about making sure our flowers were within budget. There were a couple of times where I wasn't sure we could afford several things and she fiddled with size and flower choice until it did fit our budget. Brooke is an awesome florist and person. I am so glad we went with Fields in Bloom! Brooke was so helpful in guiding us through the flower selection process, which was perfect because I know nothing about flowers! She provided many helpful suggestions. She was very easy to work with and was quick to make edits whenever we had a change of plans. The arrangements were gorgeous!! She was amazing! Easy to work with, incredibly accommodating, friendly, and we had zero problems. HIRE. HER. From the second that our wedding coordinator showed us pictures of Brooke’s work I knew she was the florist for us! And boy did she prove me right! 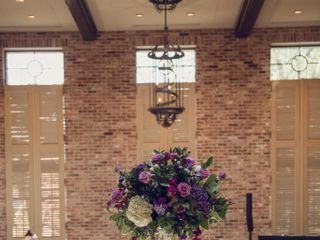 She did all the floral arrangements for our wedding at Warrenwood Manor in November 2017 and knocked it out of the park! She is gracious and easy to work with, very responsive, beyond talented, and has the brilliant ability to bring your vision to life. I would hire her a million times over! 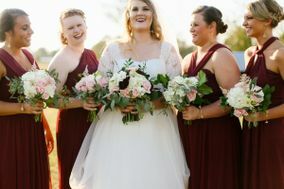 Several of our friends have upcoming weddings and Brooke was the number one vendor people asked for contact info for after seeing what she did at our wedding - everyone wants her to do their flowers! Thank you for lending us your amazing talent, Brooke! Brooke with Field and Bloom was so wonderful to work with! The bouquets were stunning and she came up with creative ways to incoprate the flowers into the ceremony back drop. Brooke was such a big help to me. Between dealing with what I wanted and my moms views she helped balance out the both. I had so many questions and ideas and so did my mom. She was so great dealing with all of our craziness and for giving me something I didn’t even know I wanted. Our Centerpieces and my bouquet was even more than I imagined. Fields in Bloom did an amazing job with the floral designs for my wedding. Owner Brooke Grow, was a dream to work with. She took my fluid ideas and made them into a gorgeous reality. I was clueless as to what flowers were in season for the month of October, the shade of rose that would go well with my color scheme, I didn't really even have a vision however, Brooke was patient with me and gave me clear direction. I appreciated receiving a detailed draft of her designs to help me visualize what would be displayed before my wedding day all while staying within my budget. She even worked in a sentimental head piece into my bridal bouquet at the last minute! I couldn't have been more pleased! Fields in Bloom has my highest recommendation! In fact, I've already sent her a new bride! Thanks Brooke for your amazing work and hospitality, it reflects that you love what you do!! Brooke knocked it out of the park for my wedding. I can't say enough wonderful things about her work and how kind she was in the whole process. I was such a flower rookie and she made everything so easy! Even with the hurricane interrupting flower deliveries and some crazy last minute adjustments on the wedding day she was fantastic. I am beyond thrilled with how everything turned out. The flowers were gorgeous and looked straight out of a magazine. She's just the best! Brooke did such an amazing job with our wedding flowers! She took the time to meet with me and figured out how to stay within our budget. 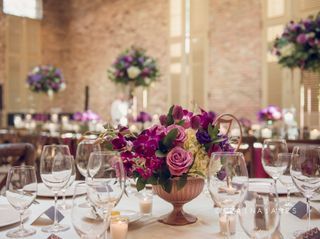 Not only were the flower arrangements within my budget but they were absolutely stunning! Brooke was so great to work with and I highly recommend Fields in Bloom! I absolutely loved working with Brooke and would 100% recommend her. From our initial meeting, I felt that Brooke truly "got me" and understood my vision. 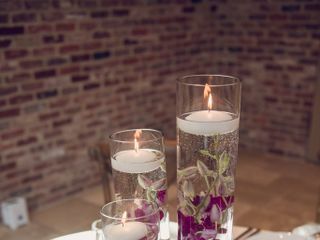 She was willing to work with me to maximize our budget to bring that vision to life with floral arrangements that really made a statement through a variety of sizes, heights, vases, flowers, etc. Brooke was consistently available and responsive to any questions or ideas that I had. Our wedding flowers and rehearsal dinner flowers turned out beautifully! Everything was on time and on budget as well. Brooke was great to work with! After 1 meeting we were on the same page and the flowers were perfect! She is prompt and quick to answer the many questions I had! Highly recommended. 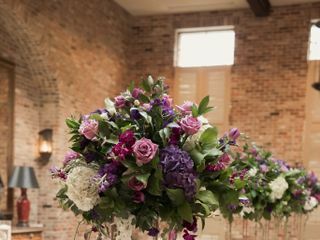 If you are looking for a young, enthusiast florist that focuses on weddings, Brooke from Fields in Bloom would be the person I would recommend. She was so helpful offering suggestions to help us stay within our budget. She was easy to work with, her work was completed in a timely manner and it spoke for itself. Her flowers were designed so pretty and were fresh for the wedding. Working with Brooke as our wedding florist was a great experience! From the first visit where we discussed my vision, to the big day - she was super responsive and professional! I really just put all my trust in her and never once worried about the final product. And I didn't have to! All of the arrangements were gorgeous and complimented our overall look. I would also say that she is very reasonably priced compared to others in town. So you can't go wrong with Fields in Bloom! Brooke was amazing to work with. My husband and I are from northern Indiana and decided to have our wedding down in Kentucky. 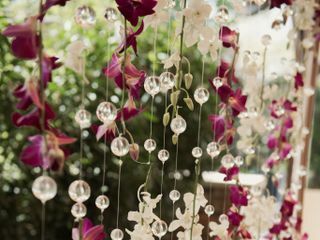 We did some research and found Fields in Bloom via Wedding Wire. Brooke was very responsive as we emailed/texted back and forth. She also worked around the times we were able to travel down from IN to visit Lexington, which was amazing considering we weren't able to make the 5 hour drive as much as we would have liked. As for the day of, the arrangements were wonderful! 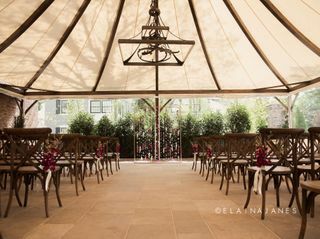 They tied everything together and the colors meshed beautifully with our set up. I would most certainly book with her if I were to do it all over again. From the moment I began planning my wedding, I knew that flowers were one of my main priorities. I had such a specific vision of my wedding day and I was nervous about trying to make it a reality (while staying within a budget!) Brooke was so unbelievably kind and patient with us, even after we changed our minds multiple times. She understood our vision, and I was blown away by her expertise and professionalism. On the day of my wedding, I literally felt like I was walking through a dream. The bouquets, centerpieces and custom arbor arrangements were indescribable. Besides my vows, holding my gorgeous bouquet was the only thing that brought me to tears that day. Fields in Bloom was the best of both worlds, amazing service AND amazing people. Worth every penny. Here is my advice to any couple getting married......hire Brooke as soon as possible after you set a wedding date! She is wonderful to work with, will work with your wants, needs, budget, and do anything and everything she can to make your wedding beautiful! She is willing to go the extra mile for you and some of the flowers she used for my daughter's wedding are still pretty two weeks later. You will not be disappointed and this is one item you can check off your list of things to worry about. Brooke from Fields in Bloom was amazing! She went above and beyond to make our flowers everything we had pictured. She worked with me from out of state and was quick to respond to my questions and last minute additions. I would highly recommend her to anyone in the Lexington area. Brooke was amazing in every way! She brought my vision to life all while being flexible with my budget. She went above and beyond and even acquired lanterns to assure that I had everything I wanted. I would not have changed a single thing about the flowers for my wedding! Brooke was awesome to work with! She was extremely easy to get a hold of and responded to my emails and texts quickly. She accommodated me when I messaged her 2 weeks prior to the wedding looking for pillar candles as decorations. She was able to provide beautiful flowers with vases that were exactly what I envisioned for my wedding day and they were within my budget! I really think that Brooke went above and beyond and I highly recommend using her for weddings or any other events! Brooke did a fantastic job putting together all of our wedding flowers. Everything was gorgeous and we got so many compliments on our flowers! Brooke was super easy to work with and willing to work within our budget and needs. She was very organized, quick to respond, and easy to get along with. I wasn't quite sure what I wanted, but I showed Brooke a few pictures of things that I liked and she was able to pick out flowers and come up with arrangements that I absolutely loved. Worth every penny! Brooke was fantastic!! I was planning our wedding from out of state and had hardly any in person meetings with any of our vendors (which was a little stressful), but Brooke was so easy to work with over the phone and email - she asked all the right questions to someone who knows nothing about flower terminology and understood exactly what I was going for and made my vision come to life exactly how I imagined it. 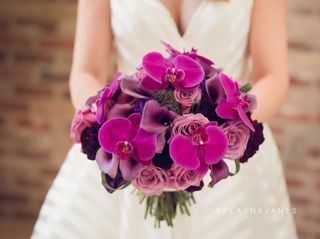 I was obsessed with our bouquets and arrangements and would definitely have Fields In Bloom do my flower design again. I can't recommend her enough!